Quest passport cuntegna in chip da datas electronic. Il passaport sto vegnir tractà cun quità e na dastga betg vegnir faudà, sturschi, donnegià u exponì a champs electromagnetics ferms. Mintga perdita dal passport sto vegnir annunziada al proxim post da polizia. In passport ch’è puspè vegni chattà na dastga betg pli vegnir utilisà. I see you utterly confused! This is Rumantsch Grischun, an “artificial” take on a language which has up to six local variants in eastern Switzerland, predominantly in the Canton of Graubünden / Grigioni / Grischun. So outside of a Swiss passport, I have not seen one real living and breathing case of Rumantsch. Heading onto Highway 19, Tracy and I headed to the town of Disentis / Mustér (Disentis in German, Mustér in Rumantsch). On the way there, I saw my first real sample of Rumantsch. Holy shiitake. This language is alive! My first reaction was one of wow, happy to know that the language spoken by a mere 0.5% of the Swiss population, remained alive and well. Number two was a very impressive, multilingual sign at the town’s main station. Although in this day and age, Mandarin Chinese might make a little bit more sense than Japanese, seeing how many of us from China are virtually “taking over” the Alpine republic… as is the case everywhere else! 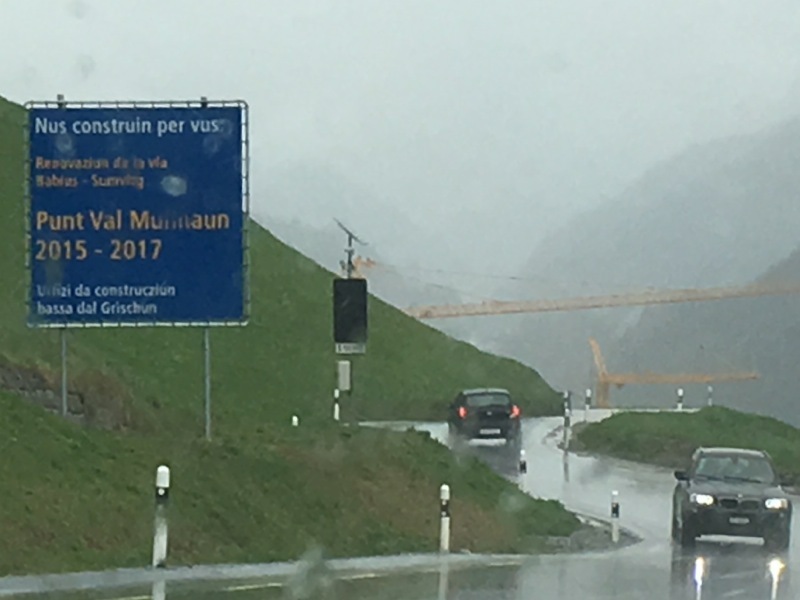 Number three was a mix of road signs and place names in Rumantsch just east of Disentis / Mustér. This language was alive! My end, I’m launching a Rumantsch Grischun mini-version of the website in mid-September 2016. 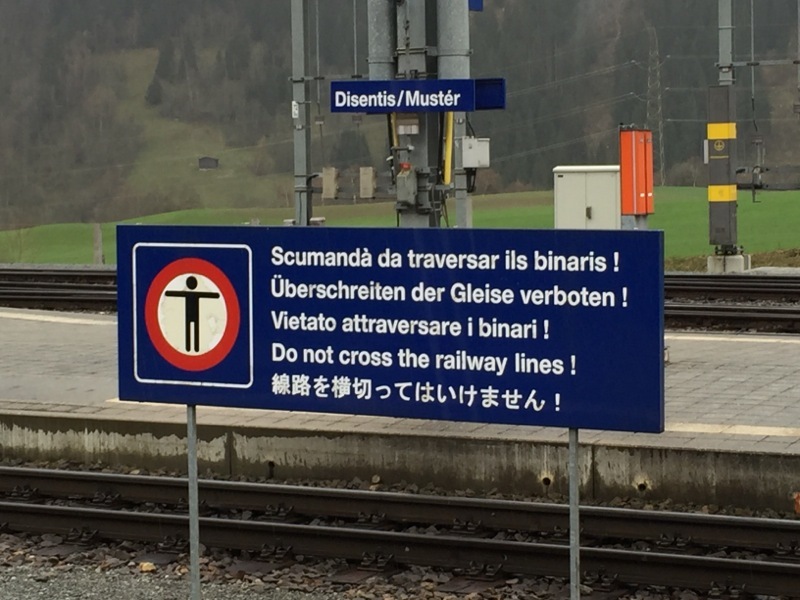 I love to do this — and equally love to keep a language that is so much part of Switzerland. 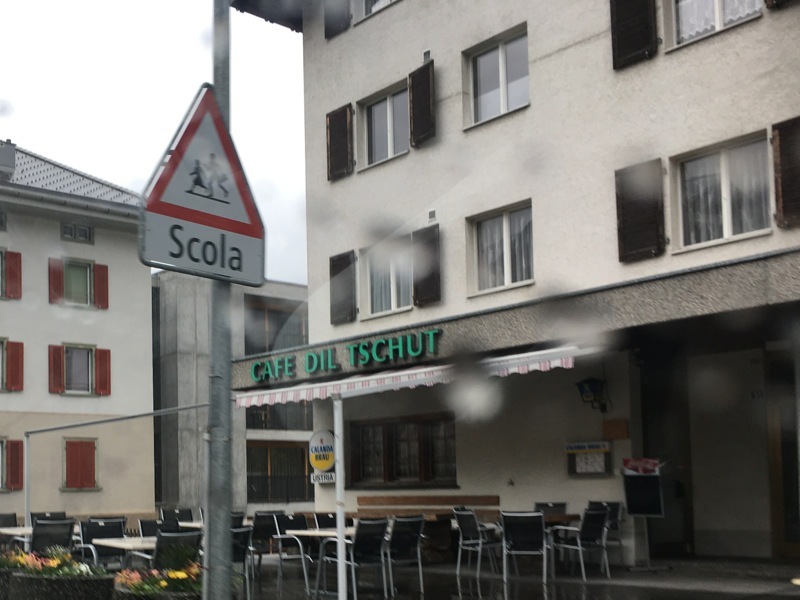 Switzerland is not “itself” without this quintessential language, no matter how few people speak it.